ELA Container Offshore GmbH will participate at ONS 2016, Offshore Northern Seas, from 29 August – 1 September, in Stavanger, Norway. 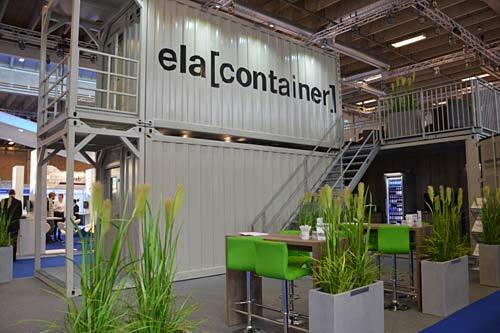 At booth 335/1 as part of the German pavilion, ELA will showcase one Offshore Office Container and one Offshore Living Quarter as well as ELA’s own matching stairways and gangways. “We are happy that we were able to secure one of the last available spots. The size and worldwide prominence of this exhibition is impressive and will give us the opportunity to further promote our accommodation containers to an international audience,” says Katharina Pleus, Marketing Manager of ELA Container Offshore GmbH. This is the first time that ELA Offshore will be exhibiting at the ONS in Stavanger. “This is an important step to introduce our product line to the Norwegian market and demonstrate on-site the quality of our containers to our clients,” says Hans Gatzemeier, Managing Director of ELA Container Offshore GmbH. Visitors can expect an interesting and well conceived exhibition. “We are looking forward to meeting our existing clients as well as making new contacts. At our booth, visitors will have the opportunity to see and experience our Offshore Living Quarters for themselves. Of course, companies who want to bring the ELA-Concept to the Norwegian market as a distributor are most welcome to inquire,” continues Gatzemeier. ELA Container has already gained diverse experience in the offshore wind and offshore oil and gas industry. Whether on pontoons, transformer platforms, rigs or supply vessels – ELA Container is the ideal partner, offering tailor-made concepts for all requirements in the form of Living Quarters, Offices, Dining Rooms, Galleys, Laundries, Recreation or Locker Rooms and all types of Carrying Units. ELA Offshore containers are equipped with all the necessary utilities. This guarantees, in combination with all ELA Offshore features, a long service life, functionality and comfort.